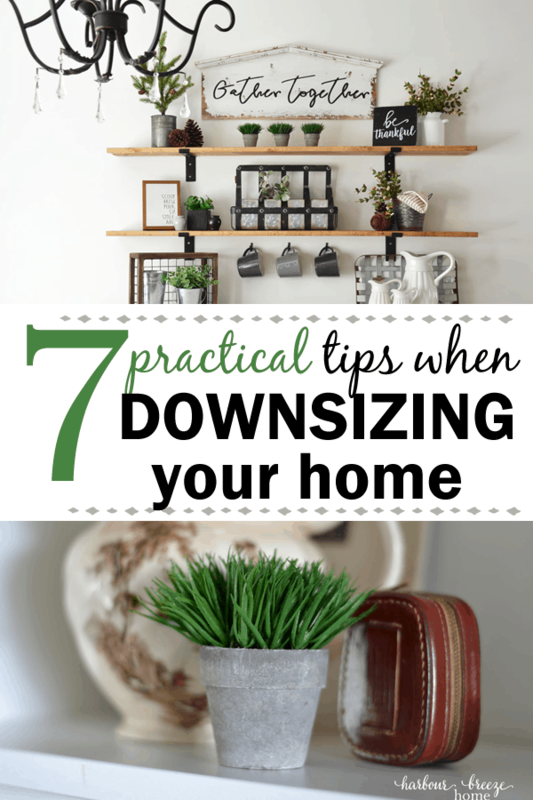 In this article: Written from first hand experience, learn about downsizing your home: best tips and advice to make it a positive experience. I’ll be honest. I didn’t choose downsizing. It chose me. Nearly 3 years ago, we uprooted our life (25 years worth) and eventually ended up in a 1250 square foot townhouse. 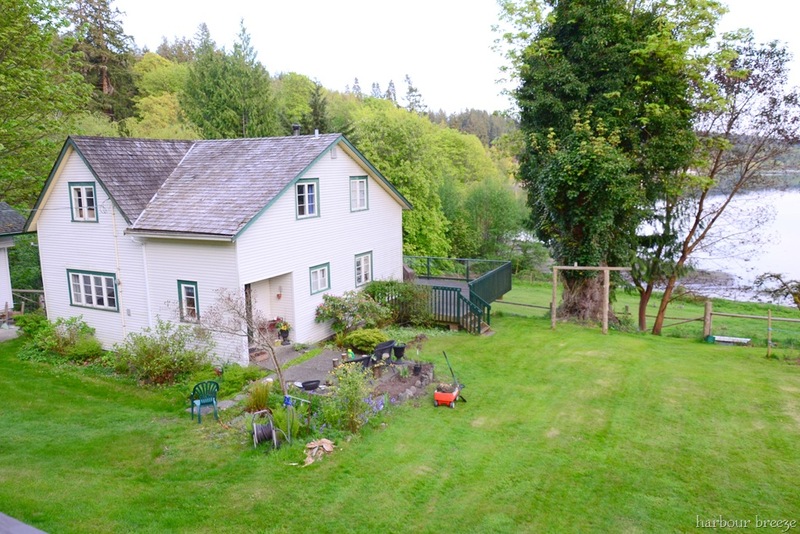 Our current home is the extreme opposite of the big farmhouse by the sea that we previously lived in. Hello, 1250 square foot townhouse. Now that I’ve been there and done that, I wanted to pass on some tips and tricks I learned through the downsizing process. *This post contains affiliate links for your shopping convenience. 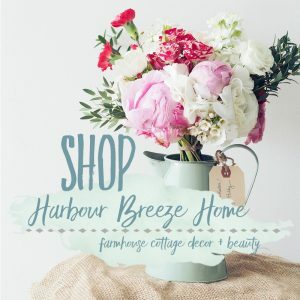 Harbour Breeze Home is a participant in the Amazon Services LLC Associates Program, an affiliate advertising program designed to provide a means for sites to earn advertising fees by advertising and linking to Amazon.com. Determine your why (and keep reminding yourself of it!). Financial ~ A smaller home usually means less stress on the pocketbook. Health/ Maintenance of a Big Home and Yard ~ This may or may not be affected by age. Sometimes the stress & physical requirements of maintaining a large house or property is no longer with health issues. Big empty rooms/ Empty nesters ~I read that many individuals find it lonely and discouraging to live in a big home once all the kids leave the nest. Staring at empty rooms that were once filled with activity becomes depressing to them. Determining your why and holding on to that will help greatly when days come that feel overwhelming and you are questioning your sanity! Our “why” was definitely financial, with a little “empty nester” stage thrown in. At the time of our move, our youngest was just finishing High School, so we knew a space for just 2 was in our future. In many ways, downsizing and moving brings on many of the same emotions as grief. The pendulum may swing between sadness (saying goodbye to the past), overwhelm (dealing with all the details), fear (of letting go of things and what the future holds), and anticipation of the new life ahead. 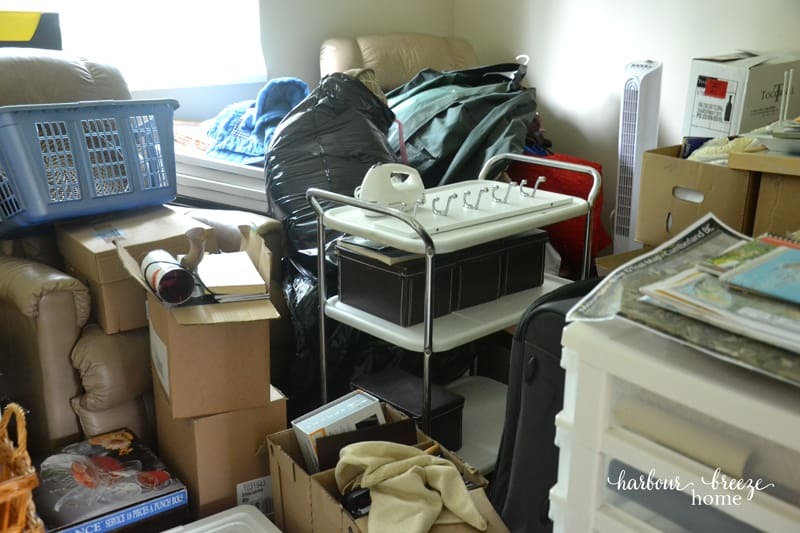 (As I was putting this post together, I found these previous articles that touched on my own emotional journey of moving: The Basement Blues; Power Packing and Goodbyes, and The Remembering Stone). 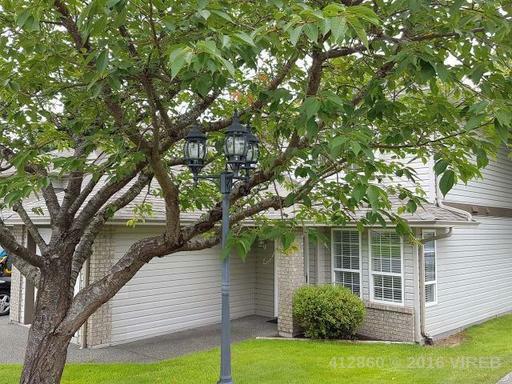 This is the stage where you determine when to move out of your old home, where you are moving to, what realtor you’re going to use, and if a moving service will help. There are so many details in this step! I found it beyond helpful in the crazy process of moving to put all the important documentation, contact information, and dates in one 3 ring binder. We called it our “Moving Bible” and it was so nice to have everything in one handy place to find. Read books like The Life Changing Magic of Tidying Up by Marie Kondo and Make Room For What You Love by Melissa Michaels for practical, actionable tips on the particulars of purging. Consider hiring a downsizing expert if you need objective advice on the particulars. Downsizing services are becoming more common. Some specialize in helping Senior Citizen transition to a retirement home room, and provide practical, thorough aide. Plan moving day carefully ~ and be prepared for many alterations to your great plan! Our downsizing journey happened quite quickly. We initially rented a lovely home for 6 months while we hunted for a new place to live. Once we chose a new home, we had less than 2 months to downsize our belongings (by over 50%) and move again! Here’s my confession. I didn’t downsize near enough before we made the move to our smaller home. Although we technically could fit everything in, we couldn’t move in it! Thankfully, one of our sons was away for a few months, so his room and the garage became the “holding rooms”. Little by little, I was able to better assess our belongings. It became easier and easier to determine what was worth keeping, and what was more of a burden than a blessing. If a person doesn’t have the physical space to hold items they are questioning whether to keep or not, I suggest the option of renting a storage space. Put the extras that you just can’t let go of in there, and then see if you miss them. If not, you can boldly let them go without regret. Once you have finished purging and have an appropriate amount of belongings, organize your new small space so it works for you. I challenged myself to get our whole. house. organized one new year. 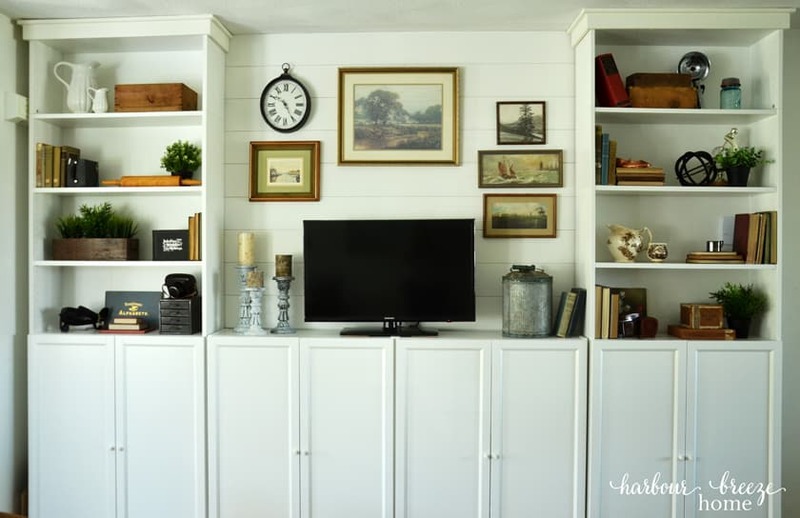 Here are the organizational details of each room in our downsized home. One thing that we realized over time is that our new smaller home required completely different types of furniture than our previous home. So, for a while we made do with what we had, but eventually sold those items. Then, using the money from those sales, we purchased solutions that worked well in our new space. The tiny stand we had for our tv looked ridiculous in this space! Plus, we were in desperate need of behind-doors storage. This system was the answer. Another example was our outdated couch set that just didn’t fit the style of our newer home. (And, let’s face it, it desperately needed to be replaced!) After lots of careful searching, we ended up purchasing a reclining LazBoy couch that fits our space and needs perfectly. As someone who has gone through the huge adjustment of downsizing drastically, I want to encourage those of you who are in the process or thinking of it. Yes, it was an adjustment. However, we are loving our new downsized life and are beyond grateful for this place that feels more like home every day. Rita – this is so good. Sharing it with my readers! Thank you so much. 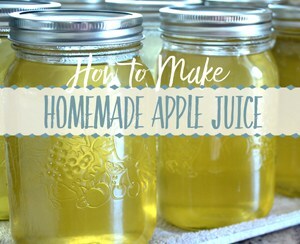 I hope it is helpful for them! Great info! 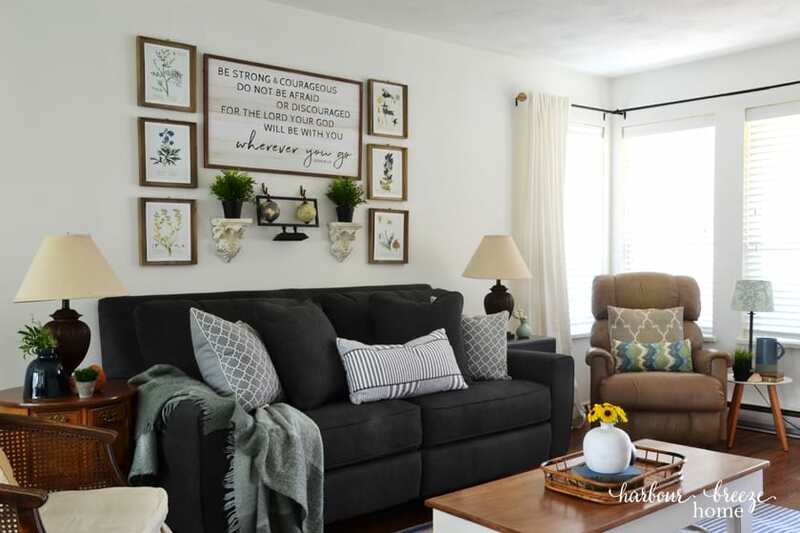 Where did you get the scripture above your couch? Love it! I found it at a Hobby Lobby while vacationing in Washington. We just love it! Thank you for sharing. 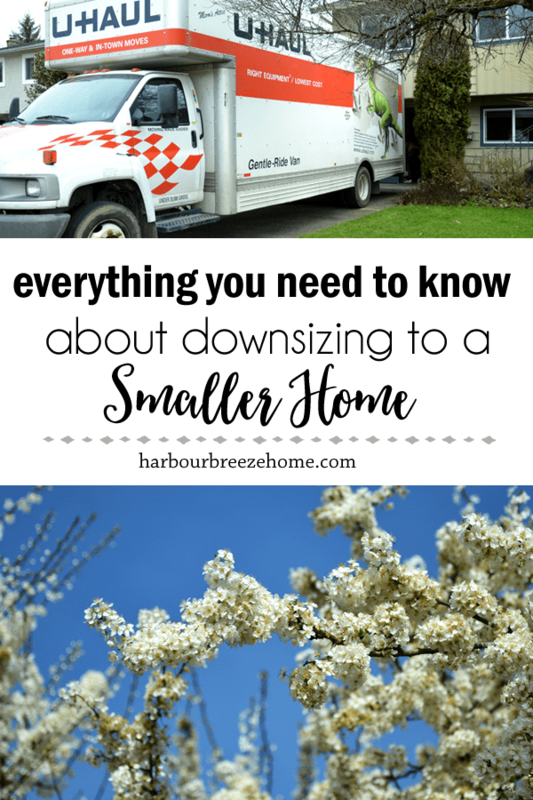 I was one of the ones that took an interest when you mentioned downsizing in your stories. Decluttering and downsizing/decluttering are not necessarily the same thing. Lots of additional things to consider! Really helpful post, Rita! 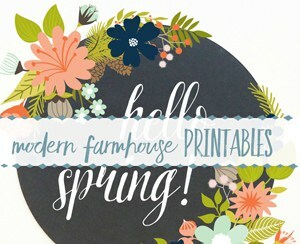 And I love that you have so many links to other helpful posts! Great! Pinned!